Your wedding saree is a thing you remain concerned about the most! 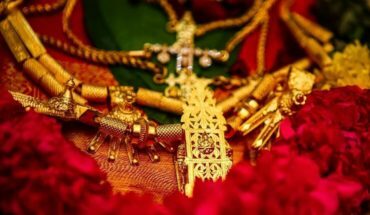 The wedding jewellery and the wedding saree for the bride always get the utmost attention of the would-be bride and her wedding planner; as it is these are the two things which will get the maximum attention on the wedding day. South India is known to produce the best Silk sarees in India. So South Indian bridal sarees are mostly found in silks with golden borders, embroidery, embellishments and in bright colours. The South Indian bridal sarees come with great pomp. Silks are the most common fabric when it comes to South Indian wedding sarees. One will find four kinds of silk used in the manufacturing of the South Indian wedding sarees, namely Mulberry, Muga, Eri Silk and Tussore. Among these four, Mulberry is being considered as the best of all. Apart from these four major fabric categorization silks are often named after the regions they are produced in or the royal patrons of those silks. Here are top seven sarees which are popular as bridal sarees in the South. Carrying a legacy of 150 years, bridal sarees made in Kancheepuram mulberry silk; are known for its bright yet unconventional colour contrasts and motif patterns in their designs. Unconventional design in form of temple borders, stripes, checks, floral patterns; etc. make the Kancheepuram silk a popular choice as wedding saree in the South. It is considered to be one of the most expensive among other wedding sarees. Mysore Silk sarees like the above two options have a predominant place in the South Indian bridal sarees collection since ages. Brightly coloured yet minimalistic in nature, these sarees are quite easy to wear. Marketed and retailed by the Government of India as KSIC saris, the Mysore Silk sarees are identified by its hologram. Check South’s sensation Tamannah Bhatia in Mysore silk in the pic given below. This silk is named after the town of Gadwal in Telangana in Andhra Pradesh; and also for the royal patronage of the Gadwal family. 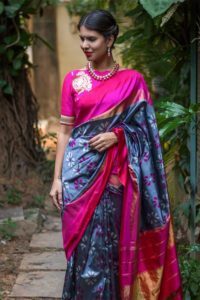 Totally different from the rest of the silks, the body of a Gadwal saree is woven in cotton, the border in zari and pallu in pure silk; afterwards, all the three fabrics are interlocked by a weaving pattern. The average length of this saree is about 5.5 meters. Thus this sari successfully establishes itself as one of the most sought after South Indian bridal sarees. Having wide borders of 10 cm to 40, Konrad silk saree is also known as Temple Silk Saree or Mubbhagam Saree. Apart from its characteristic wide border, its design carries traditional motifs and the ends have spaced zari stripes. The contemporary designs for Konrad saree come with patterns of paisleys, diamond, lotus, parrots, peacocks, and elephants to enhance its look and value even more. Thus this silk has gained a special place as popular bridal saree in South India. This south Indian sari from Chettinad district of TamilNadu is characterized by its bold stripes, checks, and contrasting shades. This South Indian bridal saree is produced in a small town called Pochampally near Hyderabad. A Pochampally Ikkat is woven blending both silk and cotton and is smoother and lighter in weight in comparison to other sarees. Venkatgiri sarees are manufactured in Nellore district of Andhra Pradesh. This sari was patronized by the ruling Venkat Giri Rajas and hence the name, and is also the reason why it is popularly known as ‘Rajmatha Sarees’. Sarees plays a vital role in our wedding attire, so make sure you make a wise choice by opting for the best collections of bridal silk sarees from South India and make your big day more bigger. 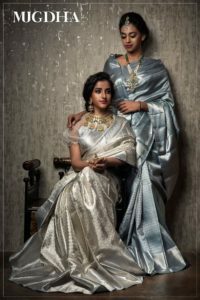 If you are looking for the best South Indian bridal sarees in Chennai, then you can contact us to get the best saree in the city.